Urinary problems are something we tend to associate more with cats than dogs, but a great many dogs suffer with urinary tract disease, and often the problem is recurring. Stress is often to blame for inducing urinary disease in cats, but in dogs the cause is sometimes harder to pinpoint. Multiple components can be at play – some, such as diet, water intake or infection can be addressed to improve symptoms, while others, like age or breed, can’t – and it is important to identify what is causing the condition or whether it is idiopathic (cause unknown and symptoms spontaneous). Age – older animals are more prone to urinary problems than younger ones, but it isn’t entirely restricted to the older age group. Breed – smaller dogs are more disposed to urinary problems than larger breeds. Schnauzers, Dalmations, Bulldogs and Yorkshire terriers are some breeds more likely to develop bladder stones. Infection – this is the most common cause of struvite formation and can usually be treated fairly easily. Alkaline urine caused by bacteria in the bladder and urethra leads to crystal formation, which need to be flushed out or dissolved. Low water intake – dogs that don’t drink readily are more prone to bladder complaints as bacteria isn’t being flushed from the system. Help by adding a bit of water to your dog’s food and ensuring the water bowl is regularly refreshed. Food – sometimes diets that are too high in magnesium and phosphate can promote the formation of struvite crystals. This is because these minerals can alter the pH of the urine. Urinary tract disease, or urolithiasis, is caused by the tract becoming inflamed or blocked, usually because of a build-up of struvite crystals which form around organic matter. Struvites consist of ammonium, magnesium and phosphate and can be found in the bladder, urethra or the kidneys. These stones cause irritation to the lining of the urinary tract, often resulting in blood in the urine, and pain. Sometimes the stones even block the passage of urine through the tract, resulting in more serious symptoms. When it comes to successfully treating urinary disease, there is no ‘one size fits all’ approach. It is important that you follow your veterinarian’s advice when it comes to treating/managing a dog with urinary disease and administering all medication as prescribed. If the bladder stones are large enough to cause an obstruction, your vet may need to remove them surgically, in which case a short stay in hospital will be necessitated. Otherwise, they can usually be dissolved by feeding a specially prescribed diet for a period of days. During this time, it is vital that you provide access to fresh drinking water around the clock and adhere to your vet’s recommendations. 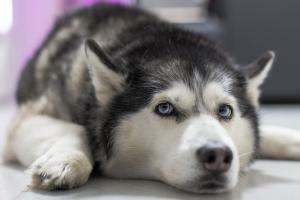 Sometimes antibiotics will be prescribed to deal with an underlying infection and, if your dog has a chronic condition, these may be given long-term at a low dose. Sometimes supplements can help prevent struvite formation, but all animals will react differently to these.